You can import a virtual machine into Oracle VM Manager and have it deployed to a server pool, or placed in the Unassigned Virtual Machines folder if you do not want to deploy it. The virtual machine must be located on an FTP or web server, either as separate files, or compressed into a single archive file (for example, a .tgz or .zip file). As an archive of a virtual machine is also known as a virtual machine template, you can also use this process to import older style Oracle VM virtual machine templates. This process does not work for the newer OVF/OVA style templates. When you import a virtual machine into a server pool, you have the option of saving it to any storage repository that is presented to at least one Oracle VM Server in the server pool. When you import a virtual machine to the Unassigned Virtual Machines folder, you can save it into any storage repository. Place the files that make up a virtual machine, or an archive of those files, in a location accessible by Oracle VM Manager using any of these protocols: HTTP, HTTPS or FTP. 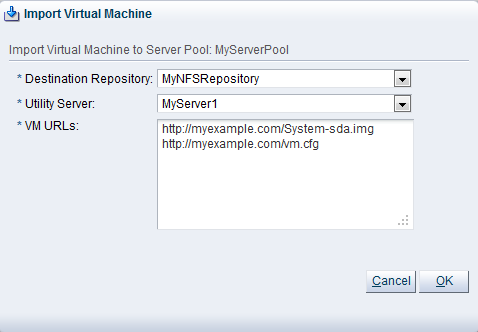 If you want to import and deploy the virtual machine to a server pool, select Server Pools in the navigation tree, then select the server pool in the management pane table. If you do not want to deploy the virtual machine, select the Unassigned Virtual Machines folder. Select Import Virtual Machine... in the toolbar in the management pane. The Import Virtual Machine dialog box is displayed. Destination Repository: The storage repository in which to save the virtual machine. Utility Server: The Oracle VM Server to use to perform the virtual machine import job. This field is populated from the list of administration servers assigned to the storage repository chosen in the Destination Repository field. Then enter the URL to the single compressed virtual machine file, in this case, vm.tgz. Click OK to import the virtual machine. The virtual machine is deployed to the server pool in the stopped state. Alternatively, the virtual machine is imported to the Unassigned Virtual Machines folder. See Section 7.10.3, “Starting Virtual Machines” for information on starting a virtual machine, and Section 7.10.2, “Editing a Virtual Machine” for information on editing a virtual machine.